I've been asked to talk about vegetable oil motoring on the radio tomorrow morning. If you are in the London area you should be able to hear it on BBC London 94.9 some time after 8:45. Update: I won't be on the radio this morning after all, as the show has been filled with a more topical story. I will probably be invited back on a less eventful day. No more twittering fan belt! Ever since I have owned my white 190, one of the pulleys that the fan belt wraps round has been slightly wonky, causing the belt to wear and make a slight noise when the weather is dry. On sunny days, it was a bit like a bird twittering. A replacement part was hard to source, so I had left it like that, until a second-hand pulley came my way recently. I've also recently changed the switch for the blower. This was causing problems as without the blower, the windscreen would steam up and I couldn't see where I was going. These kind of things are to be expected as the car is now 23 years old, and these repairs are not related to the fact I run the car on vegetable oil. A warning light has just started coming up, showing me that I need to change the glowplugs - a job for the weekend, I think. It will give me a chance to try out the new tool set I got for Christmas. 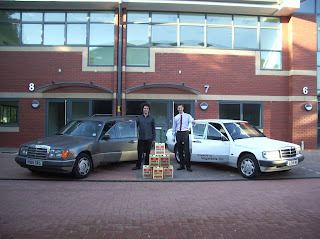 Five years of vegetable oil motoring! All has been quiet since last year, when I posted the message about running for four years. The car has been pretty reliable (touch wood) but I've had trouble getting a plentiful supply of waste vegetable oil. One of the take-aways I used to collect from has decided to dispose of it another way. This has left me a bit short of fuel on occasion. It seems like an odd post but as the cars are running well and doing there jobs of lugging us both around (and various other things/people). No complaints, no grumbles, no issues. Nothing to report. Well, apart from that I was extremely grateful of the veg running ability recently during the ridiculous panic buying. I refused to panic buy and was rewarded for my efforts by finding that I couldn't fill up with diesel when I had run out of veg. Luckily my local tesco petrol station was surprisingly empty when I rocked up to the counter to buy 20L of sunflower oil at £1 a litre, passing the empty pumps NOT full of £1.50 diesel. Its still a bit cold over night to be 100% sure sunflower oil is safe but mixed with the diesel already in the tank it seems fine. It has been four years since I bought the white Mercedes 190D known as Grease Lightning. The mileage today is 156,417. In the past four years, the car has covered over 22,000 miles on 100% vegetable oil, plus a few extra miles on the rare occasions when we put some dinosaur juice in the tank. Most of vegetable oil was filtered waste oil, which is pretty good from an environmental perspective. I'm sure a previous owner ran it on vegetable oil too, so the car's total veggy mileage is probably much higher. Not bad for a car that cost just £200! I took a nice trip to visit a friend in Ramsgate at the weekend. When I set off home, the car was very low on power and I ended up crawling along slowly for a while, particularly the uphill sections. Sorry! I tried replacing some of the fuel tubing and bypassing the pre-filter, but that didn't fix it. A miles or two later, I replaced the main fuel filter, which solved the problem and I was on my way again at full speed. I had only replaced the filter a few months ago. This indicates that a batch of fuel that I had previously filtered at home was not filtered as well as I thought it was - I'll be checking the next batch more carefully. Changing the main filter on a 190D only takes a few minutes, assuming you carry a spare, but it can be messy. The trick is to wrap a plastic bag round the old filter before you slide it out. It is also a good idea to pour some fuel into the new filter, as the car won't run until it has turned over enough times to fill the filter. The sun is shining, the weather is sweet. Makes me want to move, my filtering setup. I recently got a nice 40L batch of waste oil. I filtered it through my 1 micron filter sock and used it to collect my folks from Luton airport. Not sure the airplane part is particularly eco but at least the journey back was. I wanted to blog something about filtering in changeable weather that nobody seems to address, it may be that it simply isn't a problem but it bugs me nonetheless. As we all know the used veg picked up from restaurants contains a certain amount of different oils and fats from the food its used to cook. As long as these oils and fats are free from chips and fish heads the car actually seems to run quite happily off them as long as they are liquid enough. The problem is that if I filter when the weather is nice and hot some of the fats that get through may be less than liquid by the time they are sat in my fuel tank on a cold morning. I would have thought this would increase the risk of clogging filters when you first start up and the tank is cold. I haven't actually noticed this problem myself although I do sometimes re-filter my supply if the weather has taken a dive towards the arctic. I do feel my theory is correct but wonder why nobody seems to have problems. Both cars have survived through the winter well and are looking forward to a veggie year ahead. After a couple of airplane based holidays since my last veggie trip I am starting to get itchy feet again and feel another expedition may be needed. It may of course turn out to be some form of foot fungus but for now I will assume its the urge to travel. I haven't decided where yet. I think I may break with tradition and not go to Croatia, lovely as it is. Somewhere in Europe I would imagine. In cold temperatures, as we have at the moment, crystals can form in the vegetable oil, making it impossible to pump through fuel lines and filters. I sometimes leave a little pot of vegetable oil in the car, so I can see what it looks like when I get in the car in the morning. The crystals form as the temperature drops at night, but they don't disappear until the temperature rises a few degrees, which can leave you waiting for a warm day before you can use the car. The trick is to stop the crystals forming in the first place. I do this using a fuel additive called Coldflow 350. I add about 25ml per 10 litres of vegetable oil, and it keeps the fuel flowing. Even with the additive, the fuel is quite thick, so I also have some electric heating to warm the fuel up on its route from tank to injectors. That way, when it reaches the fuel injectors, it is thin enough to spray into a mist and ignite under pressure. The tap from the bottom of my veg filtering barrel is painfully slow unless the barrel is full so I decided to upgrade. I was using a 15mm beer keg tap (from homebrew shop) but although 15mm seems acceptable the design of the tap itself is quite restrictive. The tap has now been replaced with a 22mm one, this connects to a full bore 22mm gas tap, which can then go direct into one of veg containers for taking to the car. This is far more free flowing and about 5 times the speed so much less faffing around waiting for bottles to fill. I have also attached a long length of 19mm bore hose (designed fror KOI carp pond systems) and a cheap trigger mechanism on the end which will stretch all the way to where I park my car, but hook up nicely by the barrel when not in use. The entire setup cost about £22 in total. Once I raise the barrel up a little higher the hope is that gravity will do the rest and allow me to fill up without the use of a pump. If it fails I will use a 12v pump and run it from the aux battery in the car, so in a roundabout way the veg oil powers itself. Veg powers car > charges battery > powers pump > refills car with veg > powers car >collects veg from restaurant (powered by veg) > veg gets filtered (by gravity) > pumped to car > powers car > charges battery, oh the joys, its a wonder I get anything else done. The Retro Show is at Santa Pod this sunday. Kenny and I will both be there, mostly loitering around the Mercedes 190 stand. My car is the white 190D, which I have been running on vegetable oil for the past 3 years. As Kenny mentioned, I've replaced all of my glowplugs with Duraterm ones. I just got a new MOT and the only work that needed doing was some welding on the jacking points - similar to the work Kenny had done on his car last month. If you need any car welding done near Watford/North London, I recommend the VIP car repair centre in Bushey. It was particularly convenient for me as it is walking distance from my office. 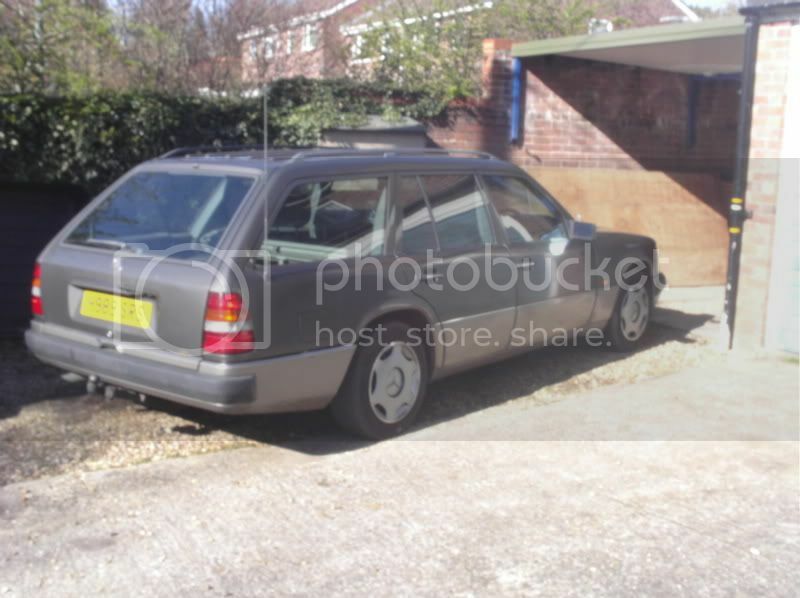 I have the wagon booked in for its MOT Saturday. It should be OK I think, I have checked all the easy things and its holding up pretty well. While they are looking at it I will get them to change the tank strainer for me. I am starting to think about my next trip but need to get the MOT out of the way first. I collected some waste oil from the take-away near Enfield that rang me over the weekend. It suited me to collect this time as I was short of fuel, but it is a bit out of my way, so I don't plan to visit them regularly. If you are a registered waste collector and are interested in a regular supply of free vegetable oil in the Great Cambridge Roundabout (Enfield) area, let me know and I'll put you in touch. I filtered some of the oil last night and it got me to work this morning. Steven here, just back from a long weekend in the Lake District. The scenery was fantastic, especially when the sun came out while we were climbing up Heron Pike. The round trip was a little under 600 miles by car, including a couple of excursions. I started with a full tank (55l) and 2 bottles containing 10 litres each - all of the fuel was filtered waste vegetable oil from my local indian take-aways. Nearly all of the fuel was used up, and I arrived home with the reserve light on. The car behaved almost faultlessly (there was a tiny issue with the fuse for the electric windows, but I swapped it for a spare). Waste carrier license renewed, and thoughts on the cost of veg cars. The time had come to renew our waste carriers license to enable us to pick up the used oil legally. Rather disappointingly Instead of a nice certificate all we got was a 1 page document to print off ourselves. Still it does give our registration number so its all above board. Last time we paid the extra to have a nice credit card type identification to show people but it didn't seem worth it this year. The cost for this license was £104 for a 3 year renewal. Works out £17.34 per car per year, beats the price at the fuel pump !! Given the actual fuel is free this is our only significant fuel cost. Unless you count the 30p per wash for the powder it takes when I wash my filters every couple of months or so. I suppose we should also factor in the extra expense of not getting free crystal wine glasses from the petrol stations we don't visit any more unless we run out of milk. It has been mentioned that for those new to the blog its hard to get an idea of what the project is about and how its progressing, so I have done some work re-arranging the pages, adding pages and adding a 'Story so far' page to help people see the project at a glance. The links are over to the right hand side. 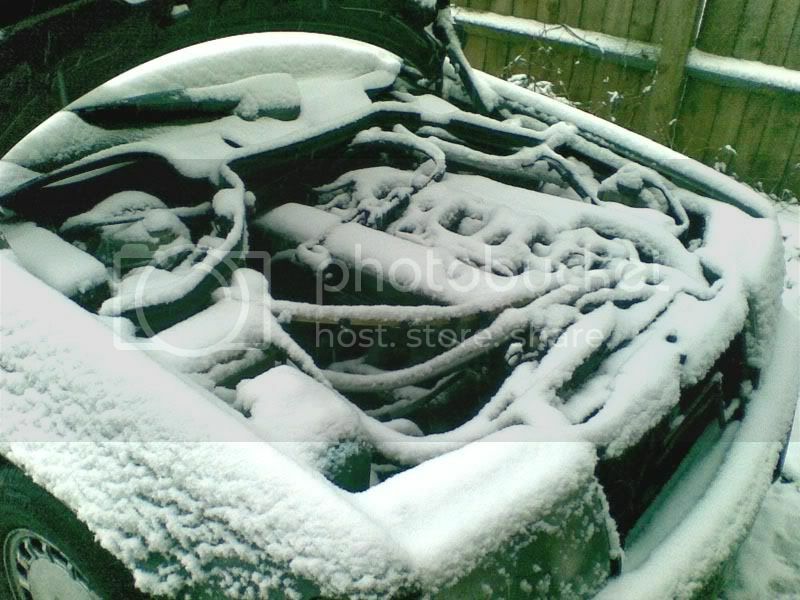 Oops, still car doesnt miss a beat even when covered in snow ! This pic is a couple of weeks old but I was outside measuring something up to provide info for a mate. It started to snow so I went inside. Obviously I forgot to go back out and finish up so next morning this is what I found !!! I closed the bonnet, it started fine and got me to work without a hiccup. I have to admit, I was slightly concerned. Running on 100% veg oil ! Its been snowing on and off here for weeks and I am glad to report that neither cars have had any problems caused by the snow and the choice of fuel. At the peak I did have to abandon mine as I couldn't get up a hill due to ice but at no point did the fuel cause any problems. It was extremely cold so I thank the coldflow 350 for that. So far its allowed be to run the car down to at least minus 6 degrees without any worry. I am sticking about 15-20ml in with each 10 litre container, then shaking the container for about 5 minutes. It then gets a further mix while in the tank. My fuel filter is due a change soon, the last change was on the hard shoulder, in the middle of the night, in the pouring rain on a german in Germany on my last trip to croatia which is over 6 months ago, I normally try to change it at least every 6 months. We are now on facebook !! Become a fan and get updates from the blog direct to your facebook account. Click here to go to our facebook fan page for carbon neutral car. Its getting pretty chilly now so I have been looking into ways to ensure the fuel doesn't wax up and clog the filters. It works out pretty cheap as you only need a very small amount. The batch used in the video was mixed for a few minutes at room temperature. Since this video was made I have been on a trip over to Bruges for the Bruges beer festival using treated veg. We stopped off in Poperinge to visit our favourite beer shop and dropped in on the monks at the Abbey of Saint Sixtus in Westvleteren. They brew some mighty fine beer which can only be obtained by visiting them in person. Well worth the trip though.